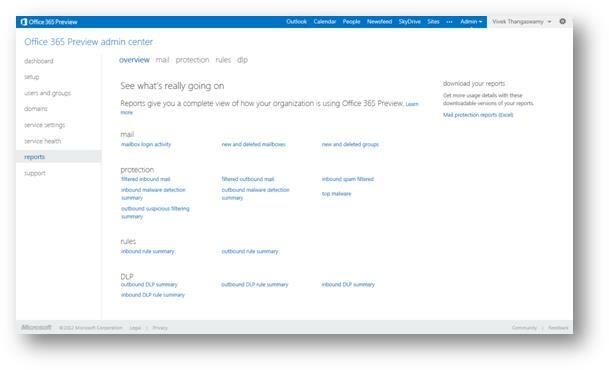 This is an introduction to Office 365 (Administration center). 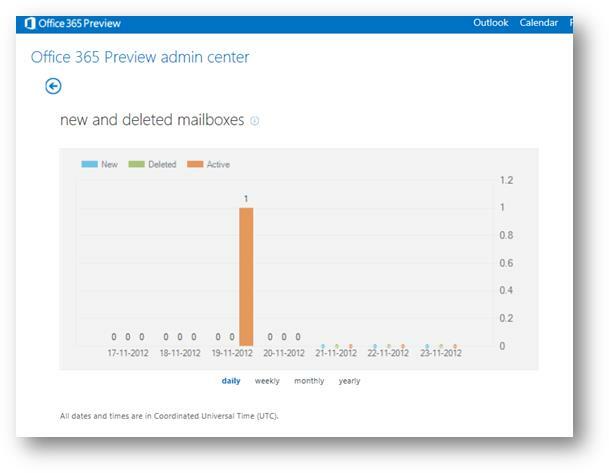 This mail will be very important for those who don’t know how to manage Admin panel of O365. Microsoft Office 365 is a cloud-based service for businesses of varied sizes that helps them create SharePoint sites to share documents and other data, Exchange mails, Lync unified communication, etc. 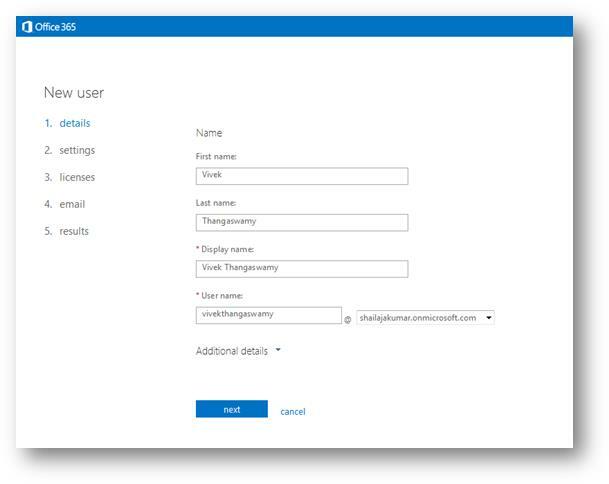 Instead of installing and deploying SharePoint Server 2013, Exchange Server 2013 and Lync 2013 on premises, organizations can sign to SharePoint Online to provide employees with collaboration and information management capabilities that work with familiar Office applications. To administer, manage and monitor Office 365 with SharePoint Server 2013, Exchange Server 2013 and Lync 2013 for an organization, we need a one stop location administrator. Microsoft has provided us Admin Center for Office 365, where administrator can control SharePoint Server 2013, Exchange Server 2013, Lync 2013 and other relevant products of Office 365. 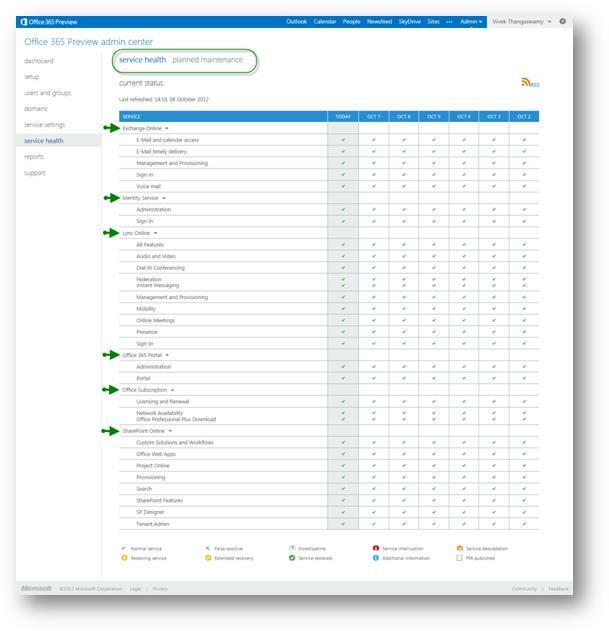 The Admin Center is the central location for all the corresponding components of Office 365, SharePoint, Lync and Exchange, etc. 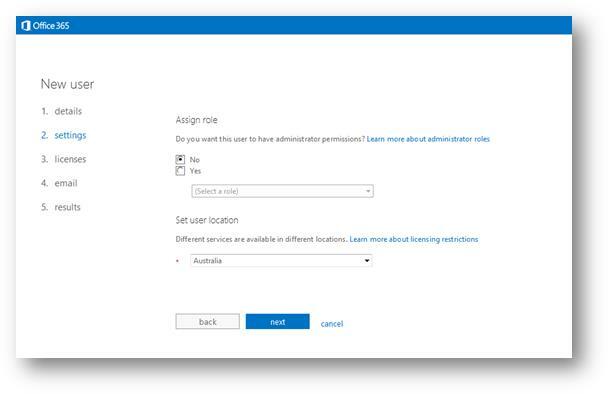 The Global administrator users of the Microsoft Online Services Portal will have permissions to manage service licenses, users and groups, domains, and subscribed services. The Admin Center page provides links for managing licenses and general system configuration. 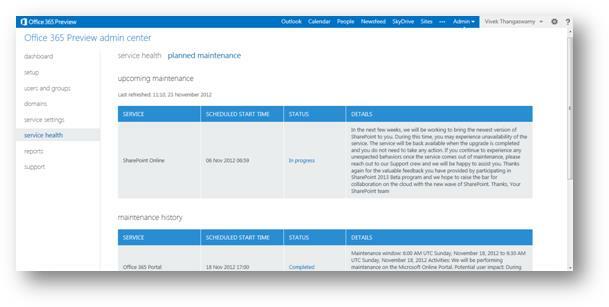 You can check on planned maintenance, enter a service request, and verify billing information. The first user created when the account was set up is configured as a Global administrator role. This gives them the ability to set up and manage additional user accounts as well as general account configuration. In the later part of the article, we will see how to create and add new roles and users. The Global administrator users will be having the dashboard view of Microsoft Office 365 environment. The following screen capture will show the dashboard view and some of the key areas have been highlighted. Let’s see what the key areas highlighted in are with numbers in the screen capture. Navigation links to all key areas to manage and administer Office365 environment. 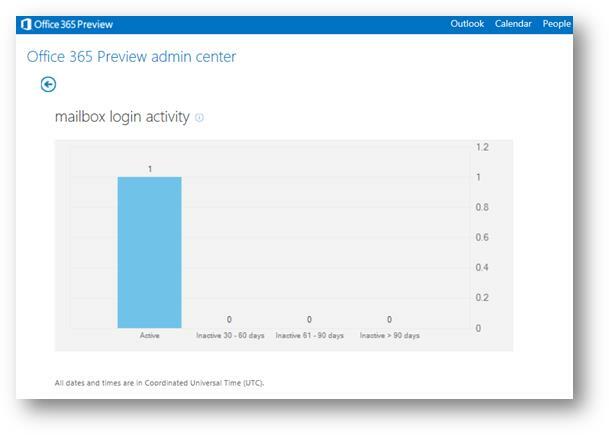 Service Overview will show service health, inactive email users and service requests. Based on the Service Overview option user can have the corresponding information. Shortcut URL to administrators for managing Office365 environment. Admin link to specific service SharePoint, Exchange and Lync, etc. Office 365 also provides an Enterprise solution that is prepared towards larger and more grown organizations. This kind of organization will likely already have an on-premise solution and want to move to a cloud-based solution. Here in this section, we will setup the Office 365 for our organization. 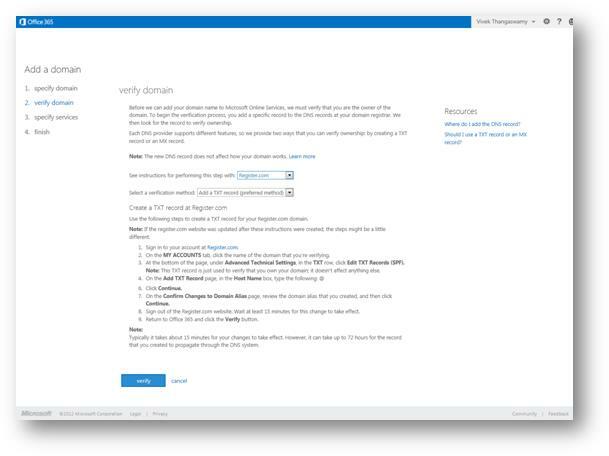 Here, we will see how to connect to existing domain and active directory details will be synced and reused with Office 365. 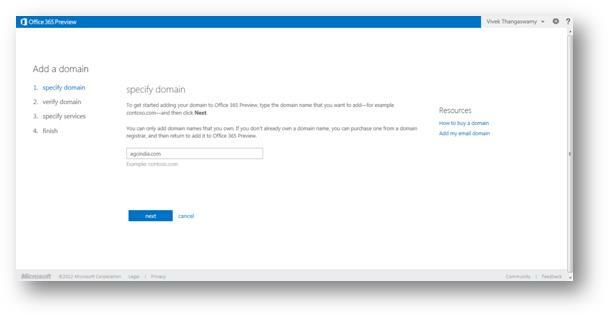 Here, the administrator will have two options to setup the domain and build the platform in the Office 365 cloud for the organization. The following are the two options for the domain setup. In the following screen capture, you will visualize how the setup page will be for administrators. 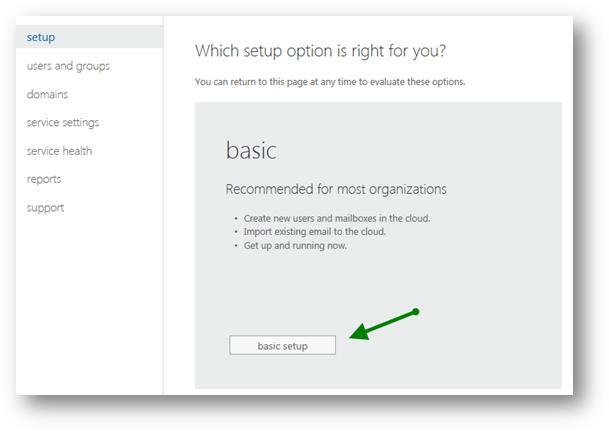 Basic: The basic setup option is mainly focused on for the organizations who wanted to create new users and mailboxes in the cloud, and can import the emails to cloud and make it up to run with minimal effort. 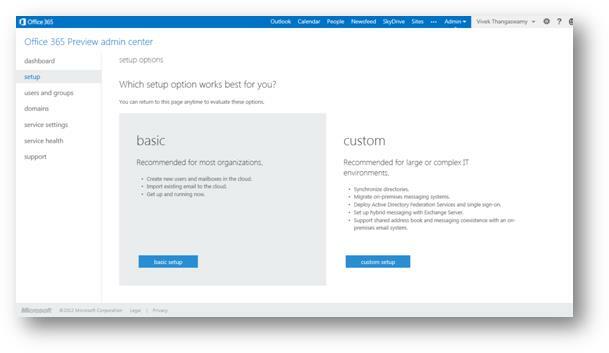 Custom: The custom setup option is for migrating on-premises messaging systems. Basically for large or complex IT environments to Synchronize directories, Deploy Active Directory Federation Services, single sign-on, set up hybrid messaging with Exchange Server, Support shared address book and messaging coexistence with an on-premises email system. Here in this demonstration, we all see how to setup using the basic option. Now click on the basic setup button as referred in the following screen capture image to proceed further. Now you will be navigated to the next page with list of all the configuration activity listed out with navigation hyperlinked. The following is the screen capture for your reference. Add users, assign licenses, and create mailboxes. Help your users get set up. Configure your domain for email delivery. Lync Online and your SharePoint team site are ready to use. Adding a domain is the first step. Only domain names that you own can be added to the domain list. 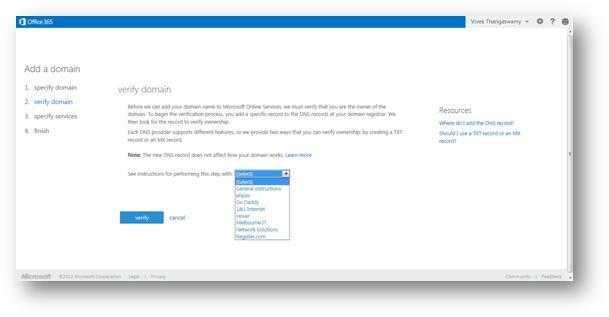 If you don’t own a domain name, you can purchase one from a domain registrar, and then return to add it to Office 365. Here in this demonstration, we’re adding a domain name called ‘agcindia’ to the domain list. Once after adding the domain name, the next step will be the domain verification page. One should be the owner of the domain, which is about to be added in the Office 365. Next is the verification process, to begin the verification process, we should add a specific record to the DNS records at your domain registrar. We then look for the record to verify ownership. Each DNS provider supports different features, so we provide two ways that you can verify ownership: by creating a TXT record or an MX record. Once after all the verification process is completed, the user will be navigated to the domain list page. Where you can manage multiple domains; edit, troubleshoot, and DNS settings, etc. Users and groups help the global administrator to manage users profiles, security groups, bulk import users, etc. Let’s start exploring options available in the users and group section. Here in the above users and group section, you can see the users listed under the active users section. First let’s see how to add single user using add option highlighted in the above screen capture. Fill in the mandatory details as listed in the above screen capture, the additional details are optional to fill in to create user. For the same user, we can provide the administrator role based on our need. 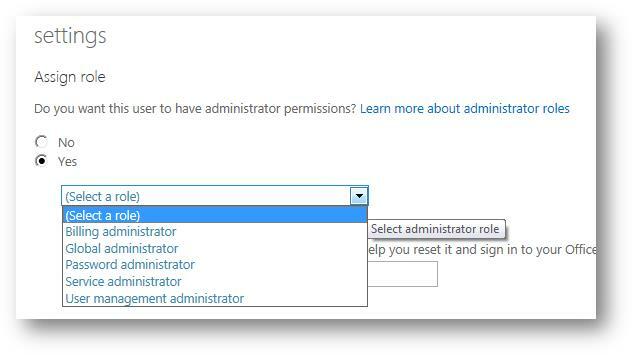 Just select the Yes option under the Assign Role and greyed ‘Select a Role’ drop down list will show you a list of different administrator roles available. 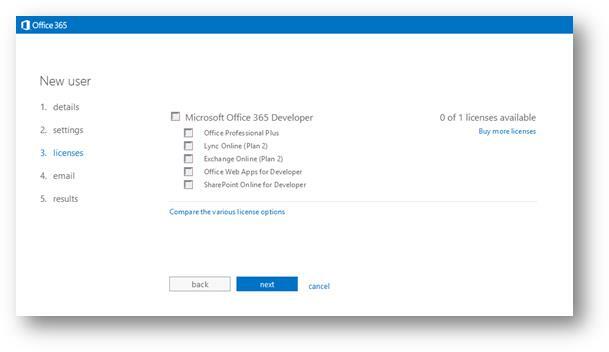 Next step will be assigning the license for the user under the Office 365; we can assign users to specific set of the products under the Office365 environment. Here in the following screen capture, you can see for my account; I no longer have any more licenses to assign for the specific user. In this case, the user will be created in the Office 365 cloud with no products to access in the Microsoft Office 365. 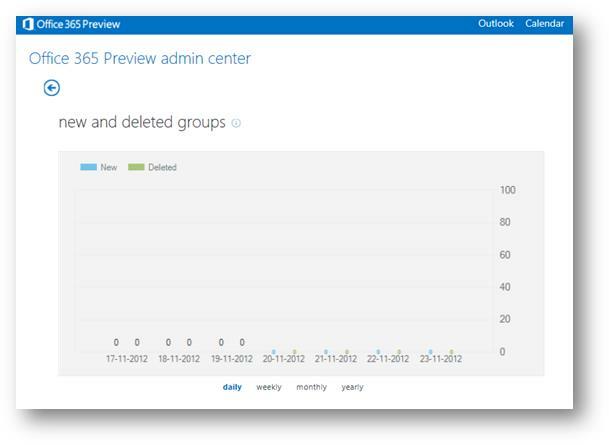 Now let’s see how the groups are created and managed in the Office 365. To create new security group, use the add option highlighted in the below screen capture. 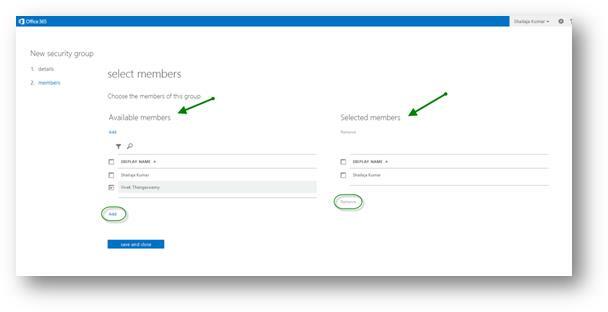 Fill in the display name for the user group and description is the optional column for your user group. Now click save to proceed to the next step of creating security group. Now the following screen will show the list of users under the available users. 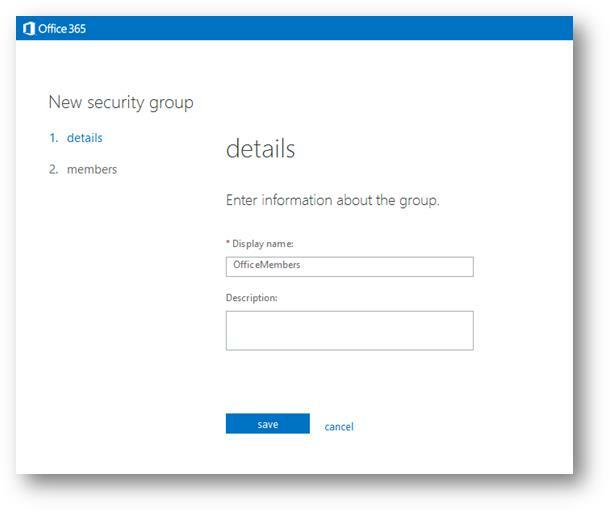 Select the users that you need to add to the security group and click Add. Service Settings is the area in which the administrator will be able to find the key administrator activity link and information. 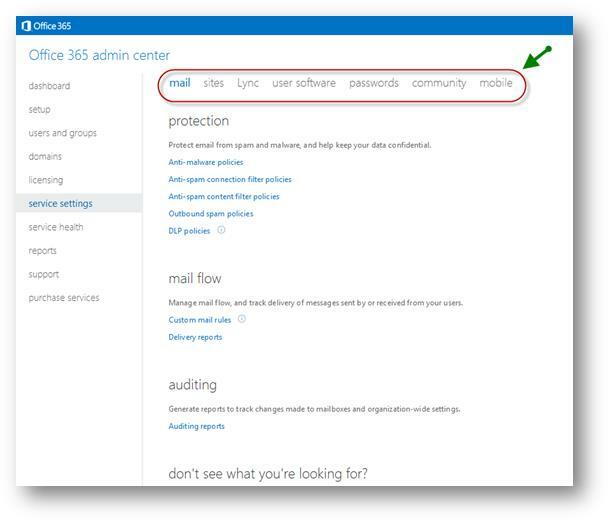 For the Exchange Server online, administrator can see the links referencing, policies to protect email from spam and malware, and help keep your data confidential, mail flow and auditing. Creating site collection link, Lync-to-phone, dial-in conference, password expiry policies and other user software links to download and install in the user computer. Service Setting contains the four main sections. 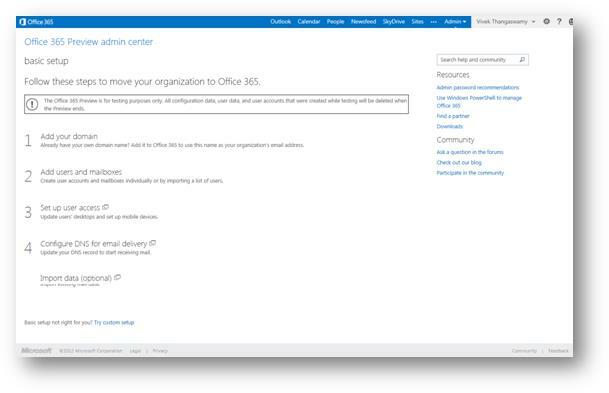 Mail – In this option, all the configuration falls under the Exchange on Office 365. We will study in detail about the same in the next article, and will explain this option under the Exchange admin center. Sites – In this option, the administrator will be able set up the Site Collection to share and publish information online. Voice & Conferencing – In this option, all the configuration falls under the Lync on Office 365. We will study in detail about the same in the next article, and will explain this option under the Lync admin center. User Software – Here you can find a list of software for download and installed directly to your laptop or personal computers. You can seeOffice 2013, SharePoint Designer 2013 and Lync 2013. Office 2013 will help you to create, edit office related files like Document, PowerPoint, Excel, etc. SharePoint Designer 2013 helps to customize SharePoint sites. Lync 2013 is a tool for instant message, voice and data communication. 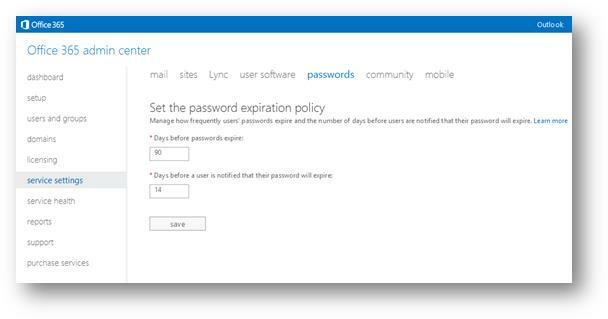 Passwords – Here, the administrator can manage the password expiration policy for the users under your Office 365. 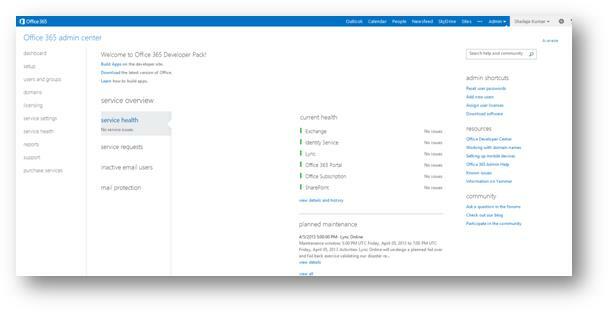 Service health will provide the complete dashboard view for all the services running under your Office 365. The view will contain the status for today with past six day’s status history. In the reports section, the administrator will be able to view the site usage, site usage, activity log and filter summary of the mails, sites and other related contents. On the Reports page, the Overview tab has a list of reports you can view. Click other tabs to see reports for relevant categories. 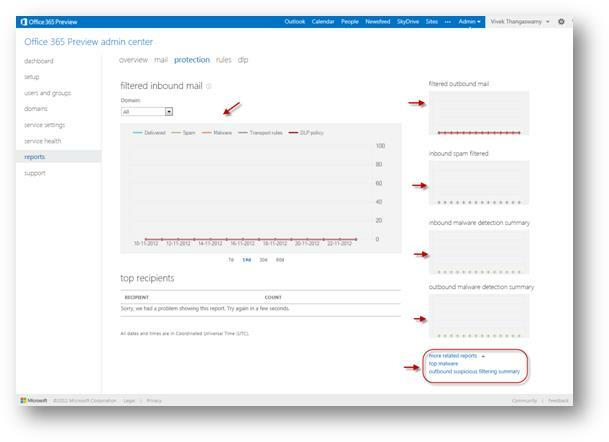 To view reports about how your organization is using the Office 365 services, go to the Office 365 admin center, and click Reports in the left pane. You can use information from these reports to identify issues, filter data, and download data into Excel. Let’s explore each one of the categories with all reports offered to administrators. Mail: The mail section covers three reports for the administrator Mailbox login activity, New and deleted mailboxes and New and deleted groups. Mailbox login activity: The number of active and inactive mailboxes over time. New and deleted mailboxes: The number of mailboxes deleted, created, and archived by day, week, month, and year. New and deleted groups: The number of groups that were created and deleted by day, week, month, and year. Filter the data: To see only the data you are interested in, use the drop-down filters above the graph, or the time-span indicators below the graph. See related information: For some reports, there will be additional information in a table below the graph. In addition, related reports are linked to from the thumbnail-sized pictures to the right of the main graph. In the reports section, all the reports, rules, etc. 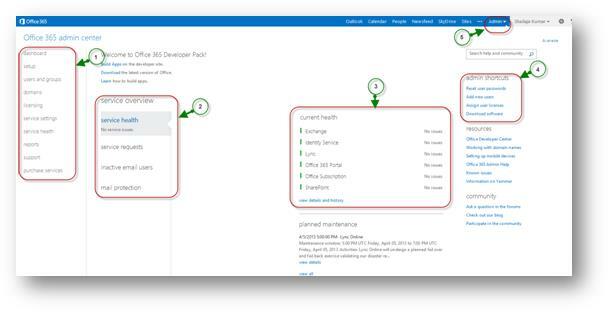 fall under the Exchange Product on Office 365. We will study in detail about the same in the next article and will explain this option under the Exchange 2013 online management.